Yes, I’ve been a very bad blogger. Actually, I’ve been blogging, just not here. 🙂 With the release of Little Shepherd at the end of August, I’ve been slammed with book promotion. I started a new blog dedicated solely to my book, which you can find here. I’m also in the midst of planning my two-and-a-half month virtual book tour with Pump Up Your Book. The tour starts on October 4th and runs through December 17th. There will be great giveaways during the tour, so make sure you check in with my Little Shepherd blog to find out all the details. It’s been about a month since I posted a From the Family Bookshelf column. I’ve done a lot of reading in that time, Dad not so much. The Lil Diva and the Lil Princess are now back in school, so their reading has picked up some. Let’s talk about some of these books. I know you will probably find this hard to believe, but Dad is still reading Vince Flynn’s The Third Option. The poor guy gets home from work and he’s lucky if he gets a page or two in before nodding off each night. My father-in-law just received a bag full of books by one of the hubby’s favorite authors. I wonder when he’ll have time to read those. The Lil Diva, despite kicking and screaming, now has to read 30 minutes a day in class and 20 minutes each night. Every night she has to write out her reflections from this 20 minutes of reading and turn it in. It has been a battle. Right now she’s reading, Harry the Homeless Puppy by Holly Webb. She loves Webb’s books, so she reads them more than once. I bought the Lil Princess a copy of Purple Princess Wins the Prize by Alyssa Crowne at the book fair a few weeks ago. She’s already plowing through that. 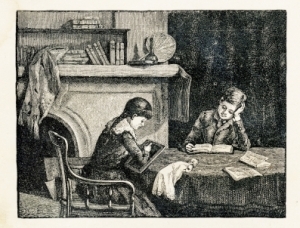 She reads a little each night, though often I find her reading to herself after school. Reviews for all the books mentioned above appear at The Book Connection. I also reviewed A Wish and A Prayer by Beth Bence Reinke, If Babies Went to School by Barbara Lock, The Golden Pathway by Donna McDine, The World Famous Miles City Bucking Horse Sale by Sneed Collard III, and The Bedtime of the Sky and Other Sleepy-Bye Stories by Carolyn Wolfe here. I finished Grounds for Murder by John Russo, a cozy mystery released by Canadian e-Publisher, MuseItUp Publishing. I’ll be posting my review of that one soon. I’m currently reading the YA novel, The Space Between Trees, by Katie Williams. That’s it for this issue of From the Family Bookshelf. I hope you’ll check back again soon for more news of great books. Come along on a magical ride into sleepy time with The Bedtime of the Sky and Other Sleepy-Bye Stories by Carolyn Wolfe. From a doll to a dragon, from a mom designing the universe to a baby in the sink, this collection of bedtime stories are filled with imagination and magical images kids will enjoy. The lyrical prose flows along and its melodies will soothe your child right into sleepy time. This is the author’s fifth book, but the only one by Wolfe I have read. I’ll certainly be on the lookout for more from this talented author and lover of furry friends. The illustrations provided by Leslie Mathis are adorable; the perfect complement to Wolfe’s prose. 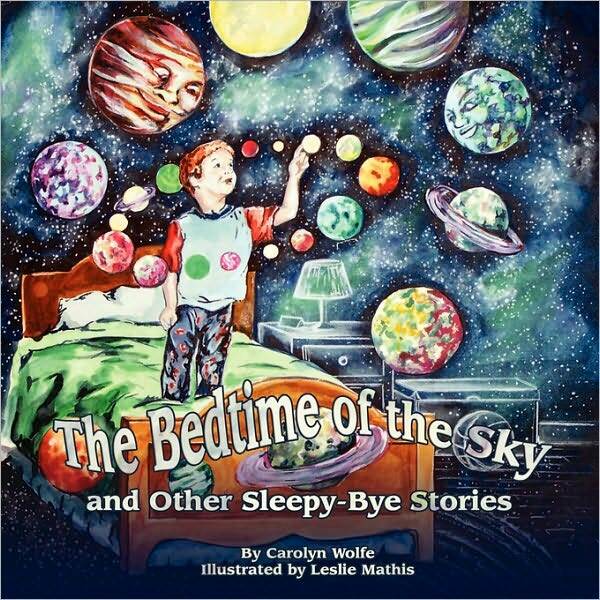 A delightful addition to your child’s home library, The Bedtime of the Sky and Other Sleepy-Bye Stories by Carolyn Wolfe will be a popular read in homes everywhere!